Drewry has waded into the debate over the European Commission’s consultation on the block exemption afforded to container lines serving the EU, which is due to expire in April 2020. The consultant said it could see “validity in both points of view” – those for an extension of the block exemption, and those against – but said shippers should “not fear alliances”, which, it contended, had actually “aided competition during a period of market concentration”. Launched in September, the EC’s consultation and review of regulation 906/2009, which offers carriers a block exemption to form joint services, operational VSAs or slot-charter agreements, as long as they do not exceed a 30% market share, has a deadline for submissions from stakeholders of 20 December. A recent report from the OECD-funded International Transport Forum, The Impact of Alliances in Container Shipping, argued that alliance structures had reduced shippers’ choice and service frequencies, along with giving rise to a decline in schedule integrity. Moreover, it maintained, the dominance of alliances had created “a dangerous instability in the industry”, given that the sheer buying power of the groupings, and the effect of changes by an alliance, can have a “destructive” impact on service providers such as ports, feeder operators and haulage. The paper urged the EC to consider allowing the block exemption to expire in April 2020, or if it is to be extended, its scope should be limited, specifically “excluding joint purchasing by alliances”. Meanwhile, “the coordinated voice for the liner shipping industry”, the World Shipping Council (WSC), wants to see the present arrangement extended, arguing that even the biggest carriers could not provide the same level of service individually, with the arrival of ULCVs making this more relevant. Drewry agrees that VSAs “minimise operating costs and maximise the number of competing market entities”, and suggested they offered a “win-win” result for both carriers and shippers. “Despite working in an industry that has often displayed a dark tendency for ruthless undercutting, carriers appear to brush aside any ill-feeling that might be caused by predatory commercial behaviour, and generally play well together operationally,” said Drewry. It notes that there are “few standalone container services in the key trades with VSAs and slot charter deals [are] the standard”. Drewry pointed to the Asia-North Europe tradelane, where it said “few carriers will have enough ULCVs” to run their own loops, given each service requires between 10 and 12 of the new-normal ships. 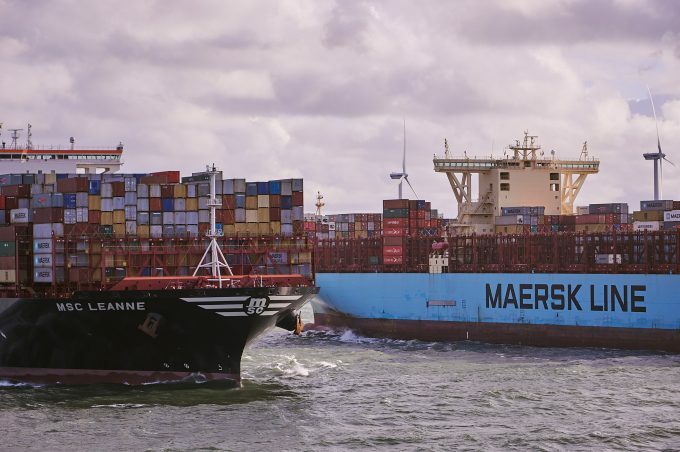 And even the two biggest carriers, Maersk and MSC, it suggested, could not operate more than three weekly loops on their own, against the current six of the 2M Alliance, which was the primary reason for the two rivals to form the alliance. “Without such agreements in place, it is our view that market concentration would accelerate at an even faster pace than it is, as it would place even higher barriers of entry into European trades,” said Drewry. Drewry’s analysis has two unstated and untested assumptions, that viable competitors “must” operate ULCVs, providing services with daily frequency. If correct, the market’s entry barrier is too high, indeed.